A Russian Soyuz TMA-19 spacecraft soars into space on June 15, 2010 Eastern Time (early June 16 local time) from Baikonur Cosmodrome, Kazakhstan carrying new members of the Expedition 24 crew for the International Space Station. A Russian Soyuz spacecraft lit up the sky above CentralAsia today as it soared into space to ferry two Americans and one Russiancosmonaut to the International Space Station. The RussianSoyuz TMA-19 vehicle blasted off from Baikonur Cosmodrome inKazakhstan at 3:35 a.m.?Wednesday local time, though it was still Tuesday afternoonin the United States, where NASA flight controllers watched from MissionControl in Houston. "It's going to be a great show tonight ? with clearskies, it's going to be beautiful," American astronaut Douglas"Wheels" Wheelock of NASA told reporters before climbing aboard theSoyuz capsule alongside his two crewmates. Wheelock launched into space with fellow NASA astronautShannon Walker and veteran Russian cosmonaut Fyodor Yurchikhin, who iscommanding the two-day Soyuz trip toward thespace station. They are due to dock at the station lateThursday at 6:25 p.m. EDT (2225 GMT). 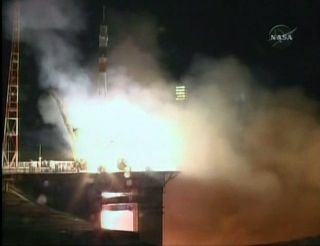 The Soyuz blasted off from the same launch pad (and on thesame day local time) that sent the first woman into space ? cosmonaut ValentinaTereshkova ? 47 years ago. It is the 100th mission to launch to the space station since construction began in 1998. "It's an honor to launch on her date, as well,"Walker has said. Yurchikhin chose the name "Olympus" ? afterOlympus Mons on Mars, the tallest peak in our solar system ? as his call signfor the Soyuz flight, NASA officials said. This is Yurchikhin's thirdspaceflight. The Soyuz TMA-19 spaceflyers are beginning a 5 1/2-monthmission to the space station and will join three other astronauts alreadyliving aboard the outpost when they arrive later this week. "We're very excited about it and we're ready to getstarted," said Wheelock, a U.S. Army captain, before launch. He is makinghis second trip to space on the mission. Over the next six months, the astronauts and cosmonautexpect to perform several spacewalks to maintain and upgrade the $100 billionspace station. They also expect to host NASA's two finalspace shuttle missions ? currently scheduled for mid-Septemberand late November ? before the U.S. space agency retires the shuttles for good. Walker is the only space rookie of the bunch, and saidshe was very happy, but a little bit apprehensive, before launch in videobroadcast on NASA TV. Walker also has a fan club. She is, after all, the first hometownastronaut for Houston ? the home of NASA's astronaut corps ? inthe more than 40 years the Texas city has served as a hub for American humanspaceflight. "Go Shannon! Whooo!" Walker's supporterscheered in the video. "Go Wheels!" Walker is married to NASA astronaut Andrew Thomas, aveteran of several spaceflights on U.S. shuttles and one months-long flight to Russia'sMir space station. A NASA spokesperson said Thomas was "excited,thrilled nervous and yes, just a tiny bit jealous" as he prepared to watchhis wife rocket into space without him. When Yurchikhin, Wheelock and Walker arrive at the spacestation Thursday, they will double the orbiting lab's crew size back up to sixpeople ? its full strength. Russian cosmonauts Alexander Skvortsov, Mikhail Kornienkoand American astronaut Tracy Caldwell Dyson have been living aboard the stationsince April and are in the middle of their own six-month stint to the outpost. The new station crewmembers said they were eager to jointheir crewmates, even as they traded jokes with children and space officialsbefore liftoff. Wheelock is also posting updates on his mission trainingand spaceflight on Twitter, where he writes under the name Astro_Wheels. "Up, up the longdelirious burning blue..." Wheelock wrote in his last Twitter post beforelaunching into space. He was quoting the poem "High Flight" by JohnGillespie Magee, an American pilot officer who served with the Royal CanadianAir Force during World War II. SPACE.com will provide complete coverage ofthe Expedition 24 crew's mission to the International Space Station. Click here for mission updates and launch updates. TheSoyuz TMA-19 will dock at the station on Thursday, June 17 at 6:25 p.m. EDT.